[SatNews] NASA’s Orbital Debris Program Office at Johnson Space Center, Houston, has reported that debris from the ICESat spacecraft fell to Earth in the Barents Sea on Monday, Aug. 30, at approximately 5:00 a.m. EDT. The agency's Ice, Cloud, and land Elevation (ICESat) satellite completed a very productive scientific mission earlier this year. NASA lowered the satellite's orbit last month and then decommissioned the spacecraft in preparation for re-entry. 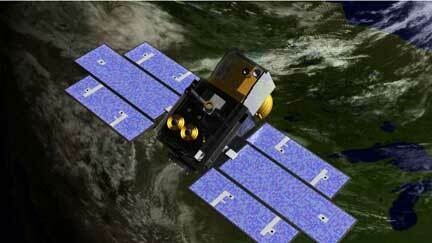 ICESat was launched in January, 2003, as a three-year mission with a goal of returning science data for five years. It was the first mission of its kind — specifically designed to study Earth's polar regions with a space-based laser altimeter called the Geoscience Laser Altimeter System, or GLAS. ICESat's lasting legacy will be its impact on the understanding of ice sheet and sea ice dynamics. The mission has led to scientific advances in measuring changes in the mass of the Greenland and Antarctic ice sheets, polar sea ice thickness, vegetation-canopy heights, and the heights of clouds and aerosols. Using ICESat data, scientists identified a network of lakes beneath the Antarctic ice sheet. ICESat introduced new capabilities, technology and methods such as the measurement of sea ice freeboard – or the amount of ice and snow that protrudes above the ocean surface - for estimating sea ice thickness. After seven years in orbit and 15 laser-operations campaigns, ICESat's science mission ended in February 2010 with the failure of its primary instrument. Because the spacecraft remained in operating condition, NASA's Science Mission Directorate accepted proposals for engineering tests to be performed using ICESat. These tests were completed on June 20. NASA's Earth Science Division then authorized the decommissioning of ICESat. After completing a review of decommissioning activities, the agency directed that ICESat be decommissioned by this August. Mission flight controllers began firing ICESat's propulsion system thrusters on June 23 to lower its orbit. Thruster firings ended on July 14, safely reducing the lowest point of the spacecraft's orbit to 125 miles (200 km) above Earth's surface. The orbit has since naturally decayed. ICESat was successfully decommissioned from operations on Aug. 14. All remaining fuel on the spacecraft is now depleted, and atmospheric drag is slowly lowering ICESat's orbit until the spacecraft re-enters the Earth's atmosphere. A statement from the Earth Science Mission Operations office summarized the achievement, "The ICESat mission operations team is commended for its exceptional performance, working tirelessly for the past eleven years (four years of preparation and seven years of operations), overcoming several obstacles in the early years of the mission, and closing out the mission with a flawless series of orbital maneuvers before final decommissioning. The positive control maintained over the mission right to the end shows the quality and effort that went into designing, building, qualifying, launching, and operating a tremendously successful mission such as ICESat."